of this. What you see below is an archived copy of the 2012 version. There's a current guide for 2013, go here. 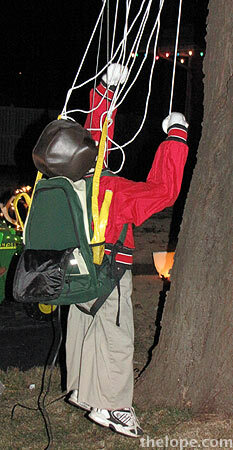 This is an archive of the 2011 update to Hutchinson, Kansas, Christmas Lights and Sights, 2010. And here's the flailing robot child. For background and lots more pictures, see To Grandma's House and Grandma's House. All of the neighborhood displays shown in Hutchinson, Kansas, Christmas Lights and Sights, 2010 are just as good as they were last year. The sound and light synced houses are running again. The only real change is that Hayes Sight and Sound does not have the "A Christmas Story" leg lamp display this year. The Fox Theatre will be showing Polar Express on Christmas evening. If you're visiting Hutchinson and have time to see only one thing, go for Dale Hankins' "Grandma's House" display at 25 Countryside Drive, where that street meets Downing Road. There are light show houses, theme neighborhoods and drive through frame displays all over the country, but I've never heard of anything like Dale's display anywhere else.